I went to a wedding on Friday, the nephew of a good friend, someone who went to school with my kids. After that, the missus and I had dinner and drove out to the lake cottage, arriving late. Over the winter the fridge there went out catastrophically, and we also had a frozen pipe that broke when the temps dropped to 20 F one night. I had wrapped the pipes previously, but the last couple of years I neglected to do the required late fall "touch up", and an uncovered spot in the carport cracked. I emptied and cleaned the dead fridge a couple of months ago, but it took until last weekend to round up some help and haul off the old one and buy a new one. The guy who does my yard fixed the broken pipe, but having the water off resulted in rust and sludge in the hot water side. By the time the weekend was over, it was back to normal, or as normal as a 60 year old house with galvanized pipes gets. The weather turned off very cool and windy, but I managed to put both power boats in the water and burn a little gas riding around. It was too rough to go fast. The weekend spent out there was quiet and peaceful, and mostly internet free, although the wife brought her iPad. We have deliberately avoided ever buying a TV set for the lake cottage. I didn't get to the sailboat. Both the sailboat and the lift need some maintenance. Maybe next weekend. It feels good to have the place back up to the usual standards, which aren't all that high, but it's fairly comfortable, and not many neighbors were around, being the weekend after Easter. It was the first trip to the lake for my new puppy, who is fast getting past puppyhood, and on to being a full grown dog. But, just like the heeler we lost, he is like an otter in he water, and he adapted well to boat riding, and behaves better onboard than the Fox Terrier, who wants to lean over the bow and try to bite the wake. In two weeks I'm going back to Chicago to attend my son's graduation from art school. He has a show he's working around the clock to finish. He is planning to stay in Chicago when he gets out. Not sure how I feel about that. You must be an artist in your dentistry work. You produced two fine artists in a cut throat world. We just happened to watch a movie about a writer last night. I am an "artist" too, just not so refined. Art keeps our imagination alive. The imagination is crucial to living a satisfied life. You guys GOT IT! Glad you repaired your cabin. 30 years old and things start melting. I don't think I mentioned....Karen was accepted to the Aaron Copeland School of Music at Queens College in NYC , and will be starting in the fall. At least my millenials are still able to live life these days, and pursue their dreams. I am grateful that it's still possible to do that. I wouldn't bet much on it being the case for too many more years. I let an extra day go by before checking on the pigs. Should have dropped by on Sunday, but I slept in. Probably the last really cool spring morning of the year....too good to spend it awake. So...yesterday I showed up, and the well pump had stopped working. The big bog in front of the water tank had practically dried up. I spent a few minutes flipping breakers with no luck, and then finally found a reset button on the junction box at the well head. It was old and the button seemed stuck....but after a couple of tries, it reset, and the water pressure came back. Lucky, but I'm going back today to make sure it's okay. Not sure if the new babies are tall enough to reach the water trough. It wasn't empty, but they usually have been able to drink from the wallow. I filled up a small trough and they all had a great time getting a drink, and I hosed off the adults, who have missed that over the cool months. I was going to leave the extra trough full, but one of the big females flipped it over. So much for trying to be nice. I don't think I mentioned....Karen was accepted to the Aaron Copeland School of Music at Queens College in NYC , and will be starting in the fall. Queens College is a short bike ride from my old McMansion where I grew up after returning from Brazil. Karen can cycle over there and tell me how it is looking these days. Maybe they will rent her the upstairs where I lived! Shoot me the address. I want to walk by, if I ever get up there. I'll take some photos. Medium bad news on the well pump. It was off again when I arrived at the stead yesterday. Once again, hitting the reset button made it come back on. Hopefully the button itself is bad, and the problem isn't being caused by the pump motor overloading. I brought my best volt meter to work with me, and I'll try to measure how many amps the pump is drawing this afternoon. I have to go every day until I get it working right. I might eliminate the reset button circuit altogether, since the well is 3 feet from the breaker box anyway, and the circuit breakers there should be adequate to kick the the pump off if it's drawing too much current. Not sure why they put that extra fusing in anyway. If anyone reading this has some idea, please tell me. That reset might be set up to trip when the pump is drawing abnormally LOW amperage, perhaps. That would be a fail-safe to turn it off if the well ran dry. I do not think the well is running dry. I once had a broken pipe and it pumped for more than a week without ever running dry, and that was in the drought years. Hopefully the reset switch is itself faulty. It doesn't feel "normal" when you push it to reset it. Found some good articles on these pump control boxes. Basically, the boxes are there so that the start capacitor can be mounted remotely from the pump motor , so that it can be replaced without pulling the pump out of the well, which is expensive and time consuming. There are some other components, but basically the way to understand the pump control box is to realize it's part of the pump motor, and not just a circuit breaker. It uses one leg of a 230V pair to power up the capacitor at start-up, and then it switches the motor to the second leg for normal running. One significant thing about that is that it isn't optional equipment. Since the pump starts and runs, at least for a while, I just need to check to see if the pump is overloading. The capacitor must be good or the pump wouldn't start. If the pump isn't overheating and drawing too many amps, then it's probably something inside the control box that's the problem, and I will have to find a new box. For more than a week, I've had problems with the new babies managing to beat the e-fence. The adult pigs still respect it, so the babies never went far, but it made me nervous, and besides, I have a couple sold, and I needed to catch them. For convenience, I had placed the feeders out in the paddock, because the original pen eventually turned into a mudhole several months ago. I couldn't get the pigs to follow me willingly from the wider paddock into the pen, even with treats in hand, so last week I put the feeders back into the pen and put up a shade tarp there too, since it's starting to get hot. I even put the last of the hay in there, so there would be very little to eat in the paddock. I finished all that on Friday and went to the lake for the weekend. Today, I left the lakehouse and swung north to the stead. I pulled up to the far end of the pen, turned off the e-fence, and filled up the feeders. I wasted a lot of feed on the ground too, so there would something available for everyone. Then I climbed over the fence and wandered off a ways...until...YES....all the pigs, including the babies, ran into the pen to gorge on fresh chow. I sauntered around the pen...and BANG, I locked the gate and wired it shut. They are jailed. Now I just hope the big pigs don't decide to destroy the pen before I can redo the e-fence. I need to move the pigs to new pasture anyway. I will keep the youngsters in the pen for the next few days to train them. The e-fence inside the pen is plenty strong to get their attention. The paddock fence must have been getting grounded out by weeds. I am going to make the paddock smaller and put three strands of hot rope on the inside of the poultry mesh. The bad thing about e-fence is that if the animals lose respect for it, it can become useless. I've got to get back to work on the pasture perimeter fence, too, just in case. The well pump appears to be fixed. All I did really, was to take the control box apart. clean the cobwebs and leaves out of it, take the reset button out and clean it as best i could....the pump has not kicked off again since about last Wednesday. So far, so good. I did determine that each of the two 120V hot legs to the pump is only pulling a little over one amp, once the motor is spinning. So it doesn't look like the pump motor really has a problem. That's good, because I wasn't looking forward to having to pull 330 ft of pipe out of the well. I spent every bit of my after work time for the last three days working on getting a new e-fence configured on new pasture for the pigs. I have to go to Chicago tomorrow after work, and won't be back until late Tuesday. I just couldn't let all thirteen pigs stay cooped up in that little pen for that long with nobody around to check on them every day. As it is, I have somebody lined up to fill the feeders on Sunday, so they should be fine. My only concern is whether the youngsters will manage to get out again. I made a two strand inner hot rope fence and hooked that to my new 3 Joule charger. It's putting out more than 5000 volts. I tested it. I have the poultry mesh for the second layer of defense, and it's putting out 3000 volts now, with no weeds to ground it out. I just don't like the way solar chargers pulse, rather than being powered up constantly. If the babies (they are really just little pigs now, they lost their stripes) get out, they won't go far, and I'll just have to lure them back into the pen when I get back. I started work at 6:30 this morning, did four patients in the operating room under general anesthesia, then went straight to the stead and got it done. I'm back home after sitting in major traffic delays for an extra hour driving back. We had thunderstorms with hail and high wind in the city. Lots of leaves knocked off the trees in my yard when I got home. My daughter told me we briefly had 60 mph winds. It's all blown over now. I'm grateful for whatever rain we got. It's suddenly gotten dry again here. Time to pack, but first a beer or two. Don't forget your laptop charger on the trip to Chi Town, and try to stay out of the way of stray bullets. Staying in the parsonage of this church, which is now a circus school. Air BnB, gotta love it. This week a group of impassioned professional and amateur circus performers made their appeal to the Logan Square community and 35th Ward Alderman Carlos Rosa for a zoning change to convert a brick church into a high-wire training facility. In perhaps a first for Chicago community zoning meeting, there was actually a circus performance to open the discussion. Billing themselves as the city's "premier teaching, training and performance space for the aerial and circus arts," Aloft Loft is seeking a zoning change for the First Spanish United Church of Chicago (3322 W. Wrightwood), at the northeast corner of Kimball and Wrightwood. The up-zoning — from RS-3 to B2-3 — is needed to legalize the church's former parsonage as a three-unit residential building and the legalize the business use in a predominantly residential area. Aloft's owner, Shayna Swanson, made the pitch to the largely supportive gathering which seemed evenly split between patrons of the school and neighboring residents supportive of the use but concerned about whether the up-zoning could result in a tear-down and large redevelopment of the site. The church was listed for sale for $1.3 million and Aloft, which is leaving its leased space at 2000 W. Fulton, has raised more than $60,000 in a crowdfunding campaign to fund the conversion if the zoning is approved. Swanson told the audience that the church's high-ceilings made it ideal for Aloft and that its location near transit was a good fit for her students who make a habit of using bicycles and transit. A recording of the meeting will also be posted on 35th Ward Alderman Carlos Ramirez-Rosa's website. No word on how quickly a decision will be made. I sold a pig today, finally. A girl. I got $500. It's a start. They must be weighing 40-50 pounds though now, and it was a bit of a struggle catching them. They flooded their pen, days ago, and its been wet-ish weather, now turning hot, so they've been swimming in mud. The mud here is a black sticky clay that blends nicely with feces, making them indistinguishable from each other. I set my old welded wire pick-up truck animal cage upside down and wired it to the outside wall of the pig pen. As the pigs rushed to the feeders (I deliberately skipped feeding them yesterday so they'd be hungry) I grabbed up four of the new pigs and tossed them over. They were so muddy I couldn't tell for sure they were even girls. It was a struggle. 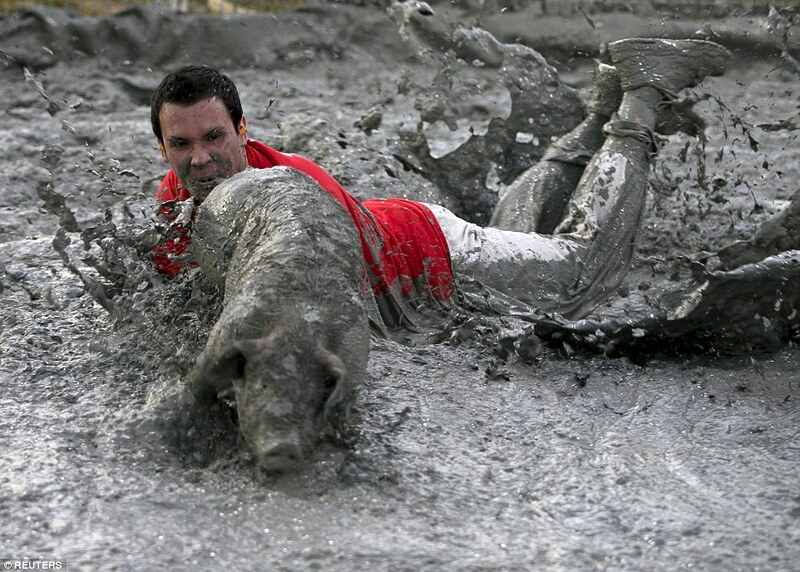 Muddy pig=Greased pig. I got three out of four females. I washed them with the pressure nozzle on the water hose until they returned to their normal color. It took a while, and they kept trying to run through the holes in the cage, because it used to be in their pen and they could get through the holes when they were younger. I used it to feed them in the beginning because the grown-ups couldn't get inside it but they could. Maybe I should use another device, because they were expecting still to get through the 4X4 inch steel mesh. Way too big now, though. Surprise! The nice couple who showed up (late) to buy the pig also have rabbits and do aquaponics. I was glad to sell to them. I know they'll take good care of their new charge. Now if I could only sell a half-dozen more. It really didn't take that long, but I'm not used to wrestling pigs. I'm pretty tired. LOL. Uncomfortably close to the real deal. I did a little better than that. Not my first rodeo.